Lung cancer is the second most common cancer in both men and women (not counting skin cancer), and is by far the leading cause of cancer death among both men and women. Each year, more people die of lung cancer than of colon, breast and prostate cancer combined. Most lung cancers could be prevented, because they are related to smoking (or secondhand smoke), or less often to exposure to radon, asbestos, or other environmental factors. Most lung cancers have already spread widely and are at an advanced stage when they are first found, but in recent years, doctors have found a test that can be used to screen for lung cancer in people at high risk of the disease. Screening is the use of tests or exams to find a disease in people who don’t have symptoms. In recent years, a test known as a low dose CAT scan or CT scan (LDCT) has been studied in people at a higher risk of getting lung cancer. 1- Current smokers or smokers who have quit in the past 15 years. 2- Have at least a 30 pack year smoking history. (This is the number of years you smoked multiplied by the number of packs of cigarettes per day), and receive counseling to quit smoking if they are current smokers, and have been told by their doctor about the possible benefits, limits and have a facility where they can go that has experience in lung cancer screening and treatments. Sometimes screening tests will show something abnormal in the lungs or nearby areas that might be cancer. Most of these abnormal findings will turn out not to be cancer, but more CT scans or other tests will be needed to be sure. Most often the next step is to get a repeat CT scan to see if the nodule is growing overtime. The time between scans might range anywhere from about a month to a year, depending on how likely your doctor thinks it is that the nodule could be cancer. This is based on the size, shape, and location of the nodule, as well as whether it appears to be solid or filled with fluid. If the nodule is larger, your doctor might also want to get another type of imaging test called a positron emission tomography (PET) scan, which can often help tell if it is cancer. 1- The doctor might pass a long, thin tube called a bronchoscope down your throat and into the airways of your lung to reach the nodule. A small, hollow needle on the end of the bronchoscope can be used to get a sample of the nodule. Fluorescence Bronchoscopy: This technique might help doctors find some lung cancer earlier, when they are likely to be easier to treat. For this test, the doctor inserts a bronchoscope through the mouth or nose and into the lung. The end of the bronchoscope has a special fluorescent light on it, instead of a normal (white) light, the fluorescent light caused abnormal areas in the airways to show up in a different color than healthy parts of the airway. 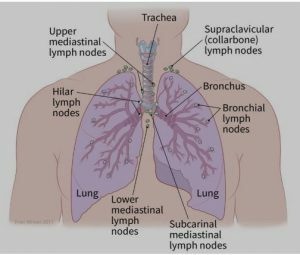 Some of these areas might not be visible under white light, so the color difference can help doctors find these areas sooner, Some cancer centers use this technique to look for early lung cancers, especially if there are no obvious tumors seen with normal bronchoscopy. Virtual bronchoscopy: This imaging test uses a chest CT scan to create a detailed 3-dimensional picture of the airways in the lung. The images can be viewed as if the doctor were actually using a bronchoscope. Virtual bronchoscopy has some possible advantages over standard bronchoscopy. First, it is non-invasive and doesn’t require anesthesia. It is also helps doctors view some airways that they might not able to get to with standard bronchoscopy, such as those being blocked by a tumor, but this test has some drawbacks as well, for example, it doesn’t show color changes in the airways that might indicate a problem. It also doesn’t let a doctor take samples of suspicious areas like bronchoscopy does, still it can be useful tool in some situations , such as in people who might be too sick to get a standard bronchoscopy. Electromagnetic Navigation Bronchoscopy: Lung Tumors near the center of the chest can be biopsied during bronchoscopy, but bronchoscope have trouble reaching the outer parts of the lungs, so tumor in these areas often needed to be biopsied using a needle passed through the skin. First CT scans are used to create a virtual bronchoscopy. The abnormal areas is identified, and a computer helps guide bronchoscope to the area so that it can be biopsied. The bronchoscope has some special attachments that allow it to reach further than a regular bronchoscope. 2- If there is a higher chance that the nodule is cancer (or if the nodule can’t be biopsied with a needle), surgery might be done to remove the nodule and some surrounding lung tissue. There are different types of lung cancer. Knowing which type is important because it affects treatment options and outlook (prognosis). Subtypes of NSCLC; which starts from different types of lung cells, But they are grouped together as NSCLC because they approach to treatment and prognosis (outlook) are often similar. Adenocarcinoma: About 40% of lung cancers are adenocarcinoma. These cancers start in early versions of the cells that would normally secrete substances such as mucus. This type of lung cancer occurs mainly in current or formers smokers, but it is also the most common type of lung cancer seen in non-smokers. It is more common in women than in men, and it is more likely to occur in younger people than other types of lung cancer. Adenocarcinoma is usually found in outer parts of the lung. Though it tends to grow slower than other types of lung cancer and is more likely to be found before it has spread, this varies from patient to patient. People with a type of adenocarcinoma called adenocarcinoma in situ (previously called bronchioloalveolar carcinoma) tend to have a better outlook than those with other types of lung cancer. Large cell (undifferentiated) Carcinoma: This type account for about 10% to 15% of lung cancers. It can appear in any part of the lung. It tends to grow and spread quickly, which can make it harder to treat. A subtype of large cell carcinoma, known as large cells neuroendocrine carcinoma, is a fast growing cancer that is very similar to small cell lung cancer. How is non-small cell lung cancer treated? A- Surgery for Non-Small Cell Lung Cancer: Surgery to remove the cancer (often along with other treatments) may be an option for early stage non-small cell lung cancer (NSCLC). If surgery can be done, it provides the best chance to cure NSCLC. Lung cancer surgery is a complex operation that can have serious consequences, so it should be done by a surgeon who has a lot of experience operating on lung cancers. If your doctor thinks the lung cancer can be treated with surgery, pulmonary function tests will be done beforehand to see if you would still have enough healthy lung tissue left after surgery. Other tests will check the function of your heart and other organs to be sure you’re healthy enough for surgery. Because surgery doesn’t help more advanced stage lung cancers, doctor will also want to check if the cancer has already spread to the lymph nodes between the lungs. This is often done just before surgery with mediastinoscopy. Pneumonectomy: This surgery removes an entire lung. This might be needed if the tumor is close to the center of the chest. Lobectomy: The lungs are made up of 5 lobes (3 on the right and 2 on the left). In this surgery, the entire lobe containing the tumor(s) is removed. This is often the preferred type of operation for NSCLC if it can be done. Segmentectomy or wedge resection: In these surgeries, only part of a lobe is removed. This approach might be used, for example, if a person doesn’t have enough lung function to withstand removing the whole lobe. Sleeve resection: This operation may be used to treat some cancers in large airways. The type of operation depends on the size and location of the tumor and on how well lungs are functioning. Doctors often prefer to do a more extensive operation (for example, a lobectomy instead of a segmentectomy) if a person’s lungs are healthy enough, as it may provide a better chance to cure the cancer. When you wake up from surgery, you will have a tube (or tubes) coming out of your chest and attached to a special canister to allow excess fluid and air to drain out. The tube(s) will be removed once the fluid drainage and air leak subside. Generally, you will need to spend 5 to 7 days in the hospital after the surgery. Video-assisted thoracic surgery (VATS): Increasingly, doctors now treat early-stage lung cancers in the outer parts of the lung with a procedure called video-assisted thoracic surgery (VATS), which requires smaller incisions than a thoracotomy. During this operation, a thin, rigid tube with a tiny video camera on the end is placed through a small cut in the side of the chest to help the surgeon see inside the chest on a TV monitor. One or two other small cuts are created in the skin, and long instruments are passed through these cuts to do the same operation that would be done using an open approach (thoracotomy). One of the incisions is enlarged if a lobectomy or pneumonectomy is done to allow the specimen to be removed. Because only small incisions are needed, there is usually less pain after the surgery and a shorter hospital stay – typically 4 to 5 days. Most experts recommend that only early-stage tumors near the outside of the lung be treated this way. The cure rate after this surgery seems to be the same as with surgery done with a larger incision. But it’s important that the surgeon doing this procedure is experienced, because it requires a great deal of technical skill. B- Ablation (RFA) for Non-Small Cell Lung Cancer: This treatment might be an option for some people with small lung tumors that are near the outer edge of the lungs, especially if they can’t tolerate surgery. RFA uses high-energy radio waves to heat the tumor. A thin, needle-like probe is put through the skin and moved in until the tip is in the tumor. Placement of the probe is guided by CT scans. Once the tip is in place, an electric current is passed through the probe, which heats the tumor and destroys the cancer cells. RFA is usually done as an outpatient procedure, using local anesthesia where the probe is inserted. You may be given medicine to help you relax as well. Major complications are uncommon, but they can include the partial collapse of a lung (which often goes away on its own) or bleeding into the lung. C- Radiation Therapy for Non-Small Cell Lung Cancer: Radiation therapy uses high-energy rays (such as x-rays) or particles to kill cancer cells. D- Chemotherapy: When might chemotherapy be used? Before surgery (sometimes along with radiation therapy) to try to shrink a tumor. This is known as neoadjuvant therapy. After surgery (sometimes along with radiation therapy) to try to kill any cancer cells that might have been left behind. This is known as adjuvant therapy. Chemo is often not recommended for patients in poor health, but advanced age by itself is not a barrier to getting chemo. As researchers have learned more about the changes in non-small cell lung cancer (NSCLC) cells that help them grow, they have developed newer drugs to specifically target these changes. Targeted drugs work differently from standard chemotherapy (chemo) drugs. They sometimes work when chemo drugs don’t, and they often have different (and less severe) side effects. At this time, they are most often used for advanced lung cancers, either along with chemo or by themselves. Bevacizumab (Avastin) is used to treat advanced NSCLC. It is a monoclonal antibody (a man-made version of a specific immune system protein) that targets vascular endothelial growth factor (VEGF), a protein that helps new blood vessels to form. This drug is often used with chemo for a time. Then if the cancer responds, the chemo may be stopped and the bevacizumab given by itself until the cancer starts growing again. Ramucirumab (Cyramza) can also be used to treat advanced NSCLC. VEGF has to bind to cell proteins called receptors to act. This drug is a monoclonal antibody that targets a VEGF receptor. This helps stop the formation of new blood vessels. This drug is most often given after another treatment stops working. It is often combined with chemo. Drugs that target cells with EGFR changes: Epidermal growth factor receptor (EGFR) is a protein on the surface of cells. It normally helps the cells grow and divide. Some NSCLC cells have too much EGFR, which makes them grow faster. Drugs called EGFR inhibitors can block the signal from EGFR that tells the cells to grow. Some of these drugs can be used to treat NSCLC. EGFR inhibitors that also target cells with the T790M mutation: EGFR inhibitors can often shrink tumors for several months or more. But eventually these drugs stop working for most people, usually because the cancer cells develop another mutation in the EGFR gene. One such mutation is known as T790M. Osimertinib (Tagrisso) is an EGFR inhibitor that works against cells with the T790M mutation. Doctors now commonly get another tumor biopsy when EGFR inhibitors have stopped working to see if the patient has developed the T790M mutation. Necitumumab (Portrazza) is a monoclonal antibody (a man-made version of an immune system protein) that targets EGFR. It can be used along with chemotherapy as the first treatment in people with advanced squamous cell NSCLC. This drug is given as an infusion into a vein (IV). These drugs can also cause more serious, but less common, side effects. For example, necitumumab can lower the levels of certain minerals in the blood, which can affect the heart rhythm and in some cases might be life-threatening. Drugs that target cells with ALK gene changes: About 5% of NSCLCs have a rearrangement in a gene called ALK. This change is most often seen in non-smokers (or light smokers) who have the adenocarcinoma subtype of NSCLC. The ALK gene rearrangement produces an abnormal ALK protein that causes the cells to grow and spread. Drugs that target the abnormal ALK protein included. These drugs can often shrink tumors in people whose lung cancers have the ALK gene change. Although they can help after chemo has stopped working, they are often used instead of chemo in people whose cancers have the ALK gene rearrangement. Dabrafenib (Tafinlar) is a type of drug known as a BRAF inhibitor, which attacks the BRAF protein directly. Trametinib (Mekinist) is known as a MEK inhibitor, because it attacks the related MEK proteins. These drugs can be used together to treat metastatic NSCLC if it has a certain type of BRAF gene change. F– Immunotherapy for Non-Small Cell Lung Cancer: Immunotherapy is the use of medicines to stimulate a person’s own immune system to recognize and destroy cancer cells more effectively. Immunotherapy can be used to treat some forms of non-small cell lung cancer (NSCLC). Immune checkpoint inhibitors: An important part of the immune system is its ability to keep itself from attacking normal cells in the body. To do this, it uses “checkpoints” – molecules on immune cells that need to be turned on (or off) to start an immune response. Cancer cells sometimes use these checkpoints to avoid being attacked by the immune system. But newer drugs that target these checkpoints hold a lot of promise as cancer treatments. Nivolumab (Opdivo) and pembrolizumab (Keytruda) target PD-1, a protein on immune system cells called T cells that normally helps keep these cells from attacking other cells in the body. By blocking PD-1, these drugs boost the immune response against cancer cells. This can shrink some tumors or slow their growth. Atezolizumab (Tecentriq) targets PD-L1, a protein related to PD-1 that is found on some tumor cells and immune cells. Blocking this protein can also help boost the immune response against cancer cells. Nivolumab, pembrolizumab and atezolizumab can be used in people with certain types of NSCLC whose cancer starts growing again after chemotherapy or other drug treatments. Pembrolizumab and atezolizumab can also be used as part of the first treatment in some people. Durvalumab (Imfinzi) also targets the PD-L1 protein. This drug is used a little differently than the other immunotherapy drugs. It is used in people with certain types of NSCLC whose cancer has not gotten worse after they have already received chemotherapy along with radiation (chemoradiation). The goal of treatment with this drug is to keep the cancer from getting worse for as long as possible. These immunotherapy drugs are given as an intravenous (IV) infusion every 2 or 3 weeks. SCLC is a special type of lung cancer that tends to grow and spread quickly. Since it has often spread outside the lung at the time it is diagnosed, it is rarely treated with surgery, it is most often treated with chemotherapy, which might be combined with radiation. The chemotherapy used is different from what is used for other types of lung cancers. Chemotherapy for Small Cell Lung Cancer: Chemotherapy (chemo) is treatment with anti-cancer drugs injected into a vein or taken by mouth. These drugs enter the bloodstream and go throughout the body, making this treatment useful for cancer anywhere in the body. When might chemotherapy be used? Chemo is typically part of the treatment for small cell lung cancer (SCLC). This is because SCLC has usually already spread by the time it is found (even if the spread can’t be seen on imaging tests), so other treatments such as surgery or radiation therapy would not reach all areas of cancer. For people with limited stage SCLC, chemo is often given along with radiation therapy. This is known as chemoradiation. For people with extensive stage SCLC, chemo alone is usually the main treatment (although sometimes radiation therapy is given as well). Some patients in poor health might not be able to tolerate intense doses of chemo. But older age by itself is not a reason to not get chemo. Doctors give chemo in cycles, with a period of treatment (usually 1 to 3 days) followed by a rest period to allow your body time to recover. Each cycle generally lasts about 3 to 4 weeks, and initial treatment is typically 4 to 6 cycles. Immunotherapy can be used to treat some people with small cell lung cancer (SCLC). Immune checkpoint inhibitors: An important part of the immune system is its ability to keep itself from attacking normal cells in the body. To do this, it uses “checkpoints”, which are proteins on immune cells that need to be turned on (or off) to start an immune response. Cancer cells sometimes use these checkpoints to avoid being attacked by the immune system. But drugs called immune checkpoint inhibitors target these proteins, helping to restore the immune response against cancer cells. Nivolumab (Opdivo) targets PD-1, a protein on T cells (a type of immune system cell) that normally helps keep these cells from attacking other cells in the body. By blocking PD-1, this drug boosts the immune response against cancer cells. It is used to treat advanced SCLC in people whose cancer continues to grow after getting at least two previous lines of treatment, including chemotherapywith either cisplatin or carboplatin. Atezolizumab (Tecentriq) targets PD-L1, a protein related to PD-1 that is found on some tumor cells and immune cells. Blocking this protein can also help boost the immune response against cancer cells. This drug can be used as part of the first-line treatment for advanced SCLC, along with the chemo drugs carboplatin and etoposide. These drugs are given as an intravenous (IV) infusion, typically every 2 or 3 weeks. Radiation Therapy for Small Cell Lung Cancer: Radiation therapy uses high-energy rays (such as x-rays) or particles to kill cancer cells. In limited stage SCLC, radiation therapy can be given at the same time as chemotherapy (chemo) to treat the tumor and lymph nodes in the chest. Giving chemo and radiation together is called concurrent chemoradiation. The radiation may be started with the first or second cycle of chemo. Radiation can also be given after the chemo is finished. This is sometimes done for patients with extensive stage disease, or it can be used for people with limited stage disease who have trouble getting chemotherapy and radiation at the same time (as an alternative to chemoradiation). SCLC often spreads to the brain. Radiation can be given to the brain to help lower the chances of problems from cancer spread there. This is called prophylactic cranial irradiation. This is most often used to treat people with limited stage SCLC, but it can also help some people with extensive stage SCLC. Radiation can be used to shrink tumors to relieve (palliate) symptoms of lung cancer such as pain, bleeding, trouble swallowing, cough, shortness of breath, and problems caused by spread to other organs such as the brain. Types of radiation therapy: The type of radiation therapy most often used to treat SCLC is called external beam radiation therapy (EBRT). It delivers radiation from outside the body and focuses it on the cancer. Treatment is much like getting an x-ray, but the radiation is more intense. The procedure itself is painless. Each treatment lasts only a few minutes, although the setup time – getting you into place for treatment – usually takes longer. Most often, radiation as part of the initial treatment for SCLC is given once or twice daily, 5 days a week, for 3 to 7 weeks. Radiation to relieve symptoms and prophylactic cranial radiation are given for shorter periods of time, typically less than 3 weeks. Three-dimensional conformal radiation therapy (3D-CRT): 3D-CRT uses special computer programs to precisely map the location of the tumor(s). Radiation beams are shaped and aimed at the tumor(s) from several directions, which makes it less likely to damage normal tissues. Intensity modulated radiation therapy (IMRT): IMRT is an advanced form of 3D therapy. It uses a computer-driven machine that moves around the patient as it delivers radiation. Along with shaping the beams and aiming them at the tumor from several angles, the intensity (strength) of the beams can be adjusted to limit the dose reaching nearby normal tissues. This technique is used most often if tumors are near important structures such as the spinal cord. Many major cancer centers now use IMRT. A variation of IMRT is called volumetric modulated arc therapy (VMAT). It uses a machine that delivers radiation quickly as it rotates once around the body. Each treatment is given over just a few minutes. Surgery for Small Cell Lung Cancer: Surgery is rarely used as part of the main treatment for small cell lung cancer (SCLC), as the cancer has usually already spread by the time it is found. Because surgery isn’t helpful for more advanced stage lung cancers, your doctor will also want to make sure the cancer hasn’t already spread to the lymph nodes between the lungs. This is often done just before surgery with mediastinoscopy or with some of the other techniques. If cancer cells are in the lymph nodes, then surgery is not likely to be helpful. 3- Lung Carcinoid Tumors: Fewer than 5% of lung cancers are lung carcinoid tumors. Carcinoid tumors are special type of tumor. They start from cells of the diffuse neuroendocrine system. This system is made up of cells that are like nerve cells in certain ways and like hormone-making endocrine cells in other ways. These cells do not form an actual organ like the adrenal or thyroid glands. Instead, they are scattered throughout the body in organs like the lungs, stomach, and intestines. Like most cells in your body, the lung neuroendocrine cells sometimes go through certain changes that cause them to grow too much and forms tumors. These are known as neuroendocrine tumors or neuroendocrine cancers. Typical Carcinoid Tumors: are not linked to smoking. They tend to be slow growing, and only rarely spread outside the lungs. Some carcinoid tumors can release hormone-like substances into the bloodstream, which might cause symptoms, Lung carcinoids do this far less often than carcinoid tumors that start in the intestines. Surgery to Treat Lung Carcinoid Tumors: Surgery is the main treatment for lung carcinoid tumors whenever possible. If the tumor hasn’t spread, it can often be cured by surgery alone. Types of lung surgery: Different operations can be used to treat (and possibly cure) lung carcinoid tumors. These operations require general anesthesia (where you are in a deep sleep) and are usually done through a surgical incision between the ribs in the side of the chest (called a thoracotomy). Pneumonectomy & Lobectomy& Segmentectomy or wedge resection & and/or Sleeve resection. Chemotherapy for Lung Carcinoid Tumors: Unfortunately, carcinoid tumors usually do not respond very well to chemo. It is mainly used for carcinoid tumors that have spread to other organs, are causing severe symptoms, have not responded to other medicines, or atypical carcinoids that are dividing quickly. Sometimes, it may be given after surgery. Because chemo does not always shrink carcinoid tumors, it is important to ask doctor about the chances of it helping and if the benefits are likely to outweigh the risk of side effects. Other Drug Treatments for Lung Carcinoid Tumor: For people with metastatic lung carcinoid tumors, several medicines can help control symptoms and tumor growth. Radiation Therapy for Lung Carcinoid Tumors: Radiation therapy may be an option for those who can’t have surgery for some reason. It may also be given after surgery in some cases if there’s a chance some of the tumor was not removed. Radiation therapy can also be used to help relieve symptoms such as pain if the cancer has spread to the bones or other areas. External beam radiation therapy: uses a machine that delivers a beam of radiation to a specific part of the body. This is the type of radiation used most often for lung carcinoid tumors. Radioactive drugs: Another type of radiation therapy uses drugs containing radioactive particles. This type of treatment is called peptide receptor radionuclide therapy (PRRT) and may be useful in treating some widespread carcinoid tumors. 4- Other Lung Tumors: Including adenoid cystic carcinomas, lymphomas, and sarcomas as well as benign tumors as hamartomas and cancer that spread to the lungs which start in other organs (such as breast, pancreas, kidney, or skin) can sometimes spread (metastasize) to the lungs.